February 1967, the Aircraft Carrier U.S.S. Shangri-La is cruising the Mediterranean sea on a 8 month deployment with the Sixth Fleet. Aboard are Thirteen young Sailors starting to think about what they will do after their service in the Navy was over. As they were all fanatic motorcycle enthusiasts, who liked to party, they all decided to start a Motorcycle Club. Agreeing on the name Warlocks, One of the thirteen designed the Blazing style Eagle, Which to this day, is unchanged on the backs of all Warlocks Brothers. They then made plans, that each of the thirteen new Brothers would found a Chapter in his hometown after retiring from the Navy. With most of the members, the euphoria passed very quickly after their return from Service. But one Brother, who took this commitment seriously enough to make this dream a reality, was Grub from Lockhart Florida. The Original Chapter he founded was on the outskirts of Orlando Florida, where the Orlando Mother chapter remains to this day. 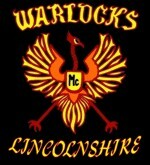 In the last four decades the Warlocks Motorcycle Club has grown tremendously. 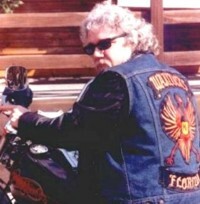 Hosting several chapters in the United States, England and Germany, with our Nomads scattered through out the states. At the top of this page, you will see a picture of the U.S.S. Aircraft Carrier Shangri-La, where it all began as a hope and dream for 13 Young Sailors, just hoping to make it home to the freedom of America, where it was and still is, possible for a man to pursue such dreams and make them come true. And below is a picture of Grub, our founding Brother, who by the way, is still an active member in the Warlocks Nation to this very day. The Warlocks of the world today are truly grateful for the commitment and dedication of our founder Grub. Many of our Brothers in the Warlock Nation will tell you "God Is Good but Grub Is Great!" Wonder why... Warlocks Forever and Forever Warlocks!